1. The River is open from the 15th March to 31st October. 2. Fishing is by unweighted fly with a single or double hook, or by worm with a single circle hook. All other baits such as prawns are forbidden. Barbless hooks are encouraged before 1st July. 3. No spinning or spinning tackle is allowed. Fly reels only, including for worm fishing. Worm fishing ends on 15th September. 4. No Sunday fishing – including from Saturday midnight to Monday 6.00am. 5. 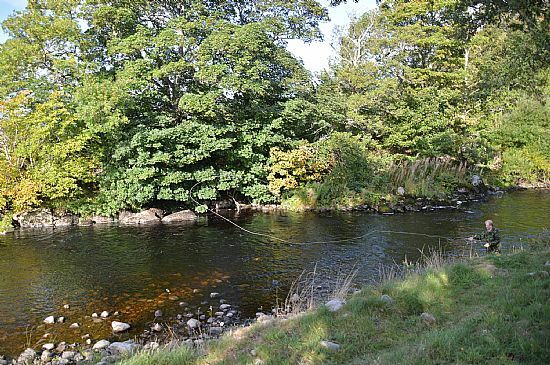 Only two salmon or grilse to be retained per angler per season, these are to be male fish under 10lbs. Sea-trout catch & release is encouraged, with only one seatrout over 1.5lbs to be kept per week. 6. All returns, including nil returns must be made by 15th November. Failure to do so may result in membership being withheld. 7. Members must carry their membership cards at all times and present it to any club member or director upon request. Failure to show a membership card may result in expulsion from the River. All visitors must carry and be willing to show their permits. 8. Anglers are expected to behave with courtesy and consideration towards other anglers and members of the public. Anglers should not enter a pool below an angler and should move down the pool at least one step every second cast. Worm anglers should give way to fly anglers. 9. Anglers should have regard for the welfare of the River and wildlife on the River, particularly no littering or discarding of fishing tackle. 10. Anglers should behave at all times in a sporting and reasonable manner and not bring the Club into disrepute. 11. Anglers are expected to bring any instances or inappropriate behaviour to the notice of the Club directors and/or the River bailiffs and/or the police. 12. No fires and no dogs. 13. All members are expected to renew by 31st March or a joining fee may be levied. All new applicants will pay a joining fee surcharge of £10. New applicants will be asked to attend a director’s monthly meeting. 14. Children or dependants of adult members may fish alongside their parent or guardian free of charge - one child per adult under strict supervision. The use of chest waders for children is not permitted. Children under 12 must not fish alone or unsupervised at any time.